Bring Your Smile In Soon! – Is the procedure going to be painful? The fabrication of dental crowns require some tooth reduction and the drilling can make the tooth a little sensitive. About 1 to 2 millimeters of the tooth will have to be removed and this can make the tooth sensitive so the procedure is performed with anesthesia. The area is anesthetized so that the procedure can proceed comfortably and relatively painless. – Am I not compromising the vitality of my tooth to be able to receive a dental crown? At first glance, the required tooth reduction greatly compromises health, especially when the tooth is completely sound, but when you begin to think about the results that you can obtain from the treatment, you can see things in a different light. This is especially true for cases where the tooth is already badly damaged or potentially brittle, after a root canal procedure. Installing a dental crown will reinforce and restore the tooth, so prolonging the life of the tooth. – What types of materials can dental crowns are fabricated with? 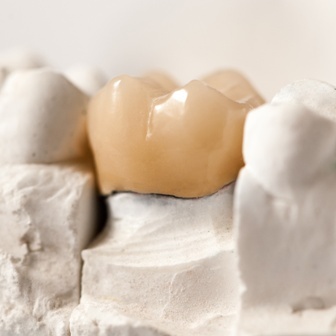 Dental crowns may be made with different materials. The most popular material used is porcelain; it gives truly aesthetic results and it is strong enough to withstand forces of mastication, allowing patients to enjoy complete function. Porcelain may or may not be made with metal reinforcement, for added strength and support. A dental crown may also be made with ceramic. Ceramic crowns offer superb aesthetics, but they are not as strong as porcelain. Plastic is another dental crown option; this offers true affordability but poor aesthetics, function and strength. – What is the potential lifespan of dental crowns? Ideally, your dental crowns should last for quite long. A properly designed and fabricated dental crown can survive for 5 to 10 years, but it can even be enjoyed for longer if the patient is lucky. Oral hygiene affects the overall lifespan of dental prosthetics. When a person can be relied on to be religious with his oral hygiene practices, he can ensure the health of his teeth, and the health of his crowns. When one’s hygiene measures cannot be relied on, the teeth will become susceptible to decay, compromising the support it offers to the crowns. – How fast can I enjoy my new teeth? Dental crown fabrication takes a while to finish. It begins with the tooth preparation, after which a temporary crown will be fitted while you wait for the laboratory to finish with the crowns. After a week or two, the finished product will be luted to the teeth and a new smile can be enjoyed.